It is still occasionally used for accompanying services although there is also an electric piano in the church. There is report of the dedication service (which was on Wednesday 26th December 1906) in the Peterborough Advertiser of December 29th 1906. The above description of the organ matches well with one I found on line, upon which what follows is based. Thomas Casson (1842-1910), a banker from Denbigh in Wales turned organ builder. Casson's instruments, supplied by a network of local dealers, were ideal for the small church. They were cheap, but sturdily built, little mechanical action organs intended for the pianist who had strayed onto the organ. Constructed from quality, durable materials, they offered not only a small one manual tracker organ at a fair price, but also a number of interesting pneumatic features that rendered the instrument capable of achieving things only a much larger instrument was capable of doing. Thus, for example, there was often a Melodic Bass, which duplicated the lowest note played on a 16ft Bourdon stop, thereby achieving the effect of a Pedal department in 4-part accompaniment of hymns and anthems. Many of the instruments had transposing devices: the organist simply moved the keyboard a note or two up or down; a portion of the keyboard curiously disappeared into the casework. 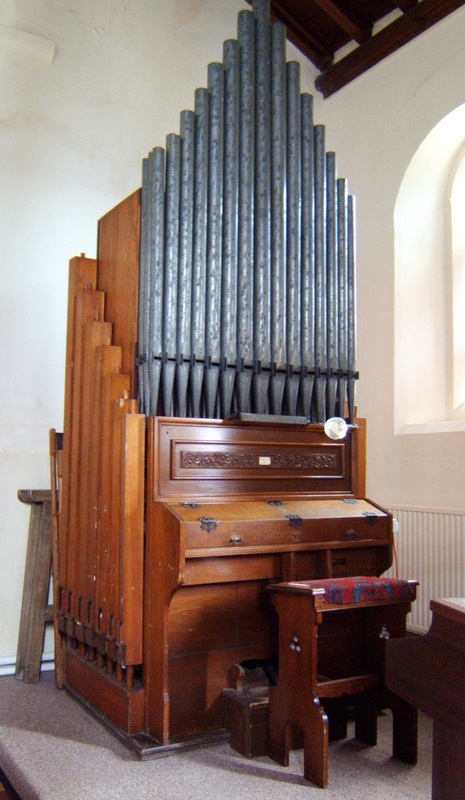 The instruments also had foot-powered feeders like a harmonium so that the organist could easily blow the organ him or herself, useful in remote churches without electricity.